In the catalogues of the Thyssen-Bornemisza collection and prior to Gaskell’s study, these panels were attributed to Joos de Momper. The view with the Castel Sant’Angel is signed with the initials “idm” at the lower left corner, while the view of the river with a village is signed at the lower centre. Joos de Momper grew up in a family of artists and both his father and grandfather were painters. In 1581 he is registered in the Guild of Saint Luke in his native city of Antwerp, working as an independent painter. From that point until around 1590, when he is again recorded in Antwerp on the occasion of his marriage, it is thought that he was in Italy where he could have met the Flemish painter living in Treviso, Lodewijck Toeput, known as Ludovico Pozzoserrato. De Momper produced an extensive oeuvre, almost none of which is signed and dated, a fact that has led to considerable problems in dating and cataloguing his work. In addition, two of his sons, Philippe and Gaspard, worked with him, as did his nephew Frans who painted landscapes in his uncle’s style. De Momper painted mountain views, forests, scenes with grottos and winter landscapes in both small and large format, and his first works reveal the influence of Pieter Bruegel the Elder and Paul Bril. His artistic personality and his work have been highly appreciated by writers on art who have seen him as the last great figure of Mannerist landscape painting, whose art led the way towards a more naturalist vision of landscape that would fully develop in the 17th century. In 1935 the present two panels were in the collection of Baroness Isbary in Vienna. They were auctioned in London in 1962 and were subsequently with a New York gallery from where they were acquired in 1967 for the Thyssen-Bornemisza collection. The paintings were first published when in the Isbary collection and in 1935 were included in an exhibition held at the Pallvicini palace. They were the subject of a text by Raczyn´ski in 1937. He recorded that during the time they were in the Isbary collection, the two panels were part of a series of five landscapes, two of them depicting Italian views, another two of ruins and one a forest with a ravine. Raczyn´ski attributed the present two panels to De Momper, partly basing his opinion on a study by Zoege von Manteuffel of around ten years earlier on a landscape (present location unknown) that was formerly in the Dresden museum and which was also signed with the monogram idm. Koester rejected the attribution of these paintings to De Momper, considering that there was little connection between the works in the group, an opinion later shared by Ertz and Gaskell. However, the two paintings in the Thyssen-Bornemisza collection do have connections with the work of De Momper. This is the case with the present view of the Castel Sant’Angelo, which has been related to a drawing by De Momper in the Albertina in Vienna, as have six other paintings by the artist that also depict the castle in different ways. 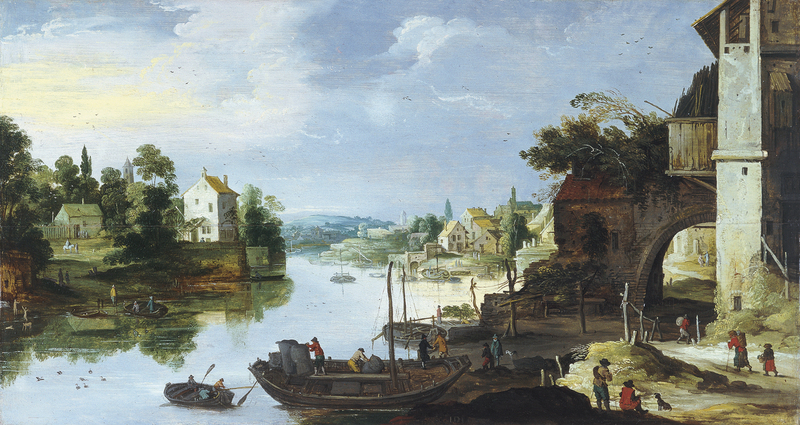 The other panel, depicting the river view, of which further versions are also known, has been related to a drawing attributed to Frans de Momper in the National Galleries of Scotland. Both panels depict picturesque villages on the banks of rivers that lead into the pictorial space though bends and curves, while human activity is depicted on either bank. Both landscapes use a high viewpoint and are elaborated using a precise type of draughtsmanship. The artist deployed earthy tones in the foreground, with large areas of shadow in these zones, as well as green and blue tones for the landscapes, which acquire a whiteish note as they recede into the far distance. Gaskell suggested that the artist who painted these panels might have been directly familiar with the work of the De Momper family workshop. He therefore considered it prudent to attribute them to an anonymous artist known only by his initials at the present time.